Brunnera is a sort of perennial plants which totals only 3 look and belongs to the family of Boraginaceae. This plant gained distribution only in the XIX century in our culture, however prompt rates won popularity among flower growers. It received the name Brunnera in honor of the outstanding botanist from Switzerland Samuel Brunner. In view of similarity to a forget-me-not to Brunner also call forget-me-not and the Forget-me-not magnificent. The most widespread look is Brunner large-leaved (Brunnera macrophylla), or as it is called in Germany, the Caucasian forget-me-not which homeland are the mountains of the Caucasus. 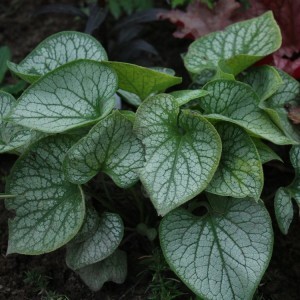 The branched, rough, trimmed stalks about 30-40 cm in height which after blossoming increase by 10 cm depart from thick and long roots of Brunnera large-leaved. Leaves oblong (about 20 cm in length), pointed, from above – dark green coloring, and from below – sulfur. Brunnera. Brunnera variety. Brunnera cultivation.